Discussion in 'iPhone and iPad Games' started by Ian_Superb, Dec 3, 2016. Now the best mobile rhythm game Pianista's league begins. 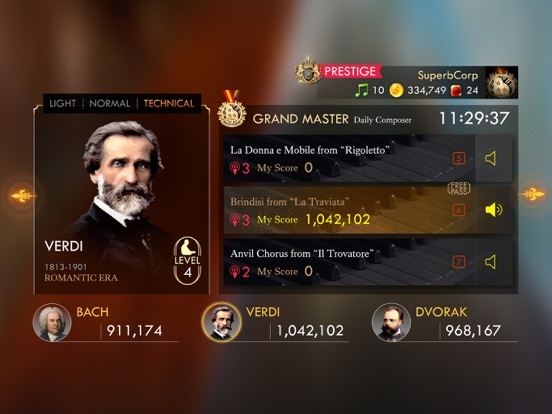 Show your best performance with the legendary classic composer in a 10-player league every day.  Legendary music pieces : Iconic pieces of classical music from world's greatest composers.  Thumb optimized : easy to play with thumbs, allow to comfortable handheld play.  Various Options : Pianista give options to play, 3 speeds and fade in-out options.  Game for everyone : Challenge yourself by completing easy to extreme songs. 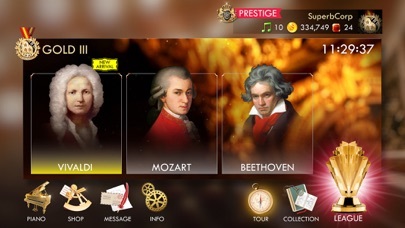  Tour mode : Clear every stages of various music pack and become a virtuoso!  Ranking system : Users globally compete each other through the ranking board in the Collection and the Tour.  League mode : Compete with others in 10 men league. You can enjoy new songs in the league also.  Prestige Membership : Subscribe and enjoy every song in Pianista freely. Coming with Daily reward.  Piano Skin : Decorative skin item made with a masterpiece, 'Piano' also has additional effect for the play such as score bonus and extra life. Upgrade your piano and get more bonus! 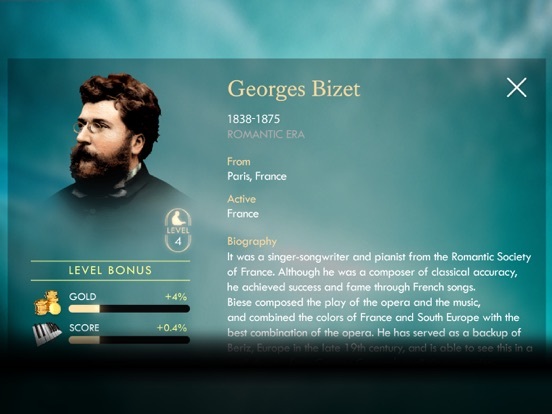  Composer level system : Play your favorite composer to get score bonus and to earn more gold.  Music Pack : New songs added through a music pack system. Essential songs of Mendelsjohn and Compilation of Ensenble is updated!  Free Music Points: Watch Video Ads and get free music points! Whole new Pianista is now available in a Appstore!  Tour mode : Clear 50 and more stages and become a virtuoso!  Ranking system : Users globally compete each other through ranking board in the Collection and the Tour.  Design Renewal : We improved App UI in every aspect for better user experience.  Additional Songs : Reflecting feedback from French and Russian users, we added 8 songs from Glinka, Tchaikovsky and Saint-Saëns. We know lots of you waiting for android version of Pianista. Android version is in testing now. It will be released soon. we just launched Pianista in Global App store! Pianista is a rhythm action mobile game inspired by playing piano. 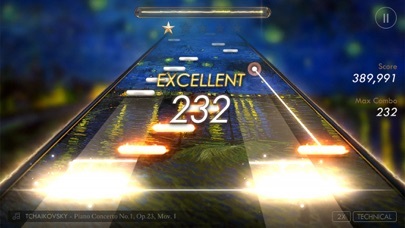 Player touch the line in a note sequence dictated on the screen. Touch with more accuracy and synchronization to the music, the game awards more points and life gauge recovery. Incorrect touch or missing the touches decrease the life gauge. Song stops and stage fails when life gauge reaches empty. Forty classical masterpieces of fourteen greatest composers are carefully selected. New selections will get updated accordingly. The App is free to play, offer In-App purchase. Google Play launch is expected in early 2017. 1. We will update the Music of Baroque and Classical Eras. 2. We will add Competition Play that players compete with others for highest score. In Competition Play, users are only allowed to join the competition with 'unlocked' songs. You can check score and ranks in the Ranking. 3. We will support more languages. 4. For countries which have problems with In-App purchase, we consider adding in-app ad (such as reward ad) in the future vs. current In-app purchases only policy. 5. 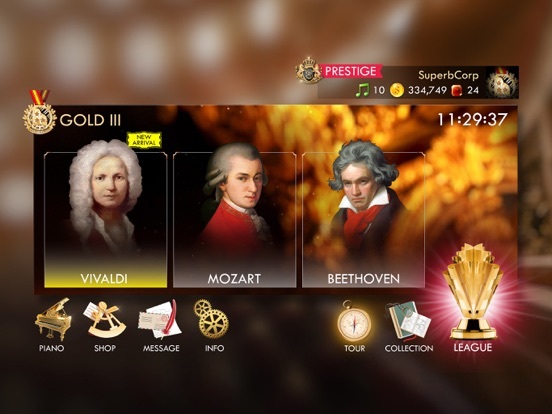 Pianista have two types of soft currency that you can obtain over time or as play rewards or bought with In-app purchases: Music Points for gameplay and Golds for song collection. We will update Skin feature, user allowed to change skin with Piano item. Pianista League Opening! Now the best mobile rhythm game Pianista's league begins. 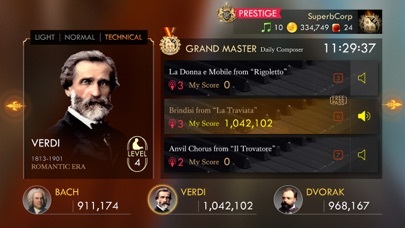 Show your best performance with the legendary classic composer in a 10-player league every day. Features • Pianista is free to play, just download and enjoy it! 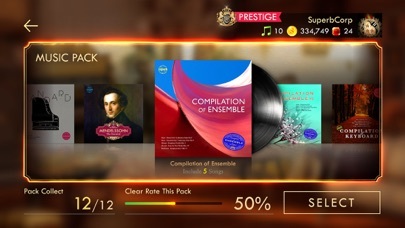 (offered In-App purchase and Subscription) • Legendary music pieces : Iconic pieces of classical music from world's greatest composers. • Thumb optimized : easy to play with thumbs, allow to comfortable handheld play. • Various Options : Pianista give options to play, 3 speeds and fade in-out options. • Game for everyone : Challenge yourself by completing easy to extreme songs. 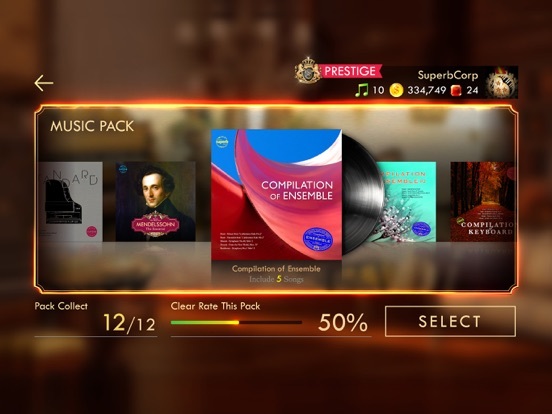 • Tour mode : Clear every stages of various music pack and become a virtuoso! • Ranking system : Users globally compete each other through the ranking board in the Collection and the Tour. • League mode : Compete with others in 10 men league. You can enjoy new songs in the league also. • Prestige Membership : Subscribe and enjoy every song in Pianista freely. Coming with Daily reward. • Piano Skin : Decorative skin item made with a masterpiece, 'Piano' also has additional effect for the play such as score bonus and extra life. Upgrade your piano and get more bonus! 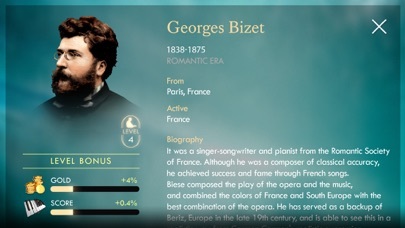 • Composer level system : Play your favorite composer to get score bonus and to earn more gold. • Music Pack : New songs added through a music pack system. • Free Music Points: Watch Video Ads and get free music points! • Messagebox : Receive and store various reward from the League and Prestige membership How to Play 1. The Note will appear and come down. 2. When the note is aligned with the line, touch the note. 3. Holding Note : With a tail line note, hold it down until it is completed. 4. Glissando Note : When shiny notes appear in a row, use a sliding motion. 5. Accuracy is important! The more you touch accurately, the more points you get. Superb corp. pianista.support@superbcorp.com http://superbcorp.com https://www.facebook.com/superbcorp https://www.youtube.com/c/pianista http://twitter.com/superbcorp © Superb Corp. & LinkedTune Entertainment Co.,Ltd. The game is pretty fun! I'm playing on an iPad mini 2 though and it's not so easy to play with only the thumbs.. maybe if we could change the orientation to portrait on the iPad? It would also be nice to have the game fill the entire screen, without the black bars. And I would *really* like to be able to turn off/down that sound effect when you finish the song and receive your star rating, because it's so loud compared to the music volume. I'd also like to see an IAP to get rid of the energy system and maybe a coin doubler. It would also be nice to have the game fill the entire screen, without the black bars. Can you even reach every note with your thumbs on the ipad ? The dude in the video is crazy fast. On most songs, yes, but it's not comfortable to hold the iPad and play. The guy in the videos is playing on 2x speed, that's insane! Geez, you see that guys' thumbs go? Wow! I'm not even gonna bother with this 'cause I can't compete with that!!! Not at all! That's nuts! Amazing to see someone do that, though! Guess I'm just too old! He's playing in 2x speed in all videos. There are three difficulty settings: speed (1x, 2x or 3x); mode (normal or technical) and fade (off, in or out). Normal mode 1x isn't so hard, give it a try! Ha! That was just blowing my mind!!! Alright then! I will give it a go! I have an iPad, though. Would rather play on a small screen/phone, as recommended! Gonna be on Android also? We are now launching Pianista globally! Thank you all again for supporting us and Pianista! I tried it. WAY too fast for me! Beautiful game, but I'm too old for this! Being a classically trained musician (piano and clarinet), who writes and records groove/prog metal and djent in his home studio (Look up "To Sleep" by Agilancer on YouTube for my first solo album), I'm absolutely loving this game. 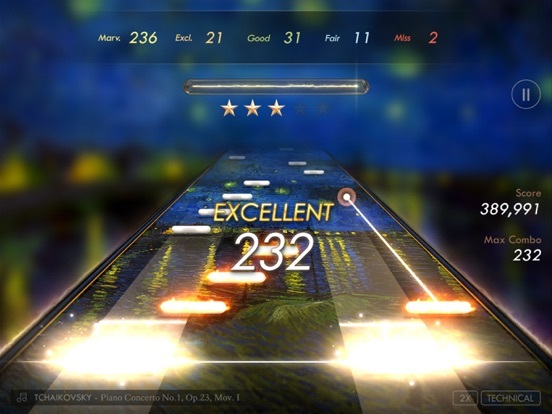 I'm a huge guitar hero/rock band fan, and used to pride myself in my ability to sight read music when I was younger, and this game definitely scratches that itch. It can be a tad fast at times, and the combo counter gets in the way a bit, by other than that, this game is going to get a lot of love from me! Never played any instrument. Don't know squat about classical music. Like guitar hero although I'm not great at it. Mostly a mobile player now. iPhone 7 and iPad Pro. Downloaded this tonight and can't stop playing. Love it. Fast yes but I'm up for a challenge. This game sounds amazing. Thumbs can be used but I set it in front and use more fingers like I'm playing a piano and it's even more fun. I feel and my wife(who plays piano) feels like we are playing it. Nice selection of songs. May be costly to unlock all songs with all the currencies. I'm feeling i will spend some money though because this game is legit. Great job devs. Look forward to competition and content updates. Goodness. Missed a note playing at 3x speed on Bach. That's what I said! Really, though? I was told it's doable even for us old farts and I could do ok on mode 1, though I have doubts since I've heard some seasoned veterans even say it's really fast! And personally I'd rather play on a smaller device than my iPad, like my phone, though I haven't heard whether this is gonna be on Android or not. I'd prefer that. Dont judge the videos..... this game on normal is not that hard. And it's freaking addicting. Love it! Kind of feel like if we unlock a song, we should be able to play it without using a music point. Yeah, that was a real bummer when I unlocked my first song and couldn't even play it. Can't find any reason to buy gold with real money now. Also, 5.99$ sounds fair for an energy system removal. Is this IAP offered or just a request for devs?